Posted by EliseG on Tuesday, December 16th, 2008, at 4:10 pm, and filed under abstract, animation, observational, remix. I love the synthesised voice over. It’s hilarious as I think it actually sounds like Shanna who made the original film! 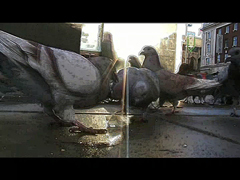 the music on this is bizarre, it makes the pigeons seem quite ‘sinister’; an angry mob. However, the synthesized voice over offers the piece a comical, more lighthearted approach.